In 2015, Lee and Low released a Baseline Diversity Survey showing that the publishing industry was devoid of diversity at nearly every level of operation, a fact that was apparent to anyone paying attention to the work and conversations that the industry produced. Fireside Fiction’s 2016 #BlackSpecFic report shined a light on the fact that the SFF short fiction market, like much of the surrounding industry, allowed anti-black bias to affect the publication rates of black writers. There is more than enough data to confirm that black writers and their work are devalued and ignored by the multiple areas of speculative fiction publishing, fandom, and culture. The FIYAH Black SFF Writer Survey Report is not a further attempt to confirm this data, nor is it a rigorous empirical study on the state of SFF publishing in general. 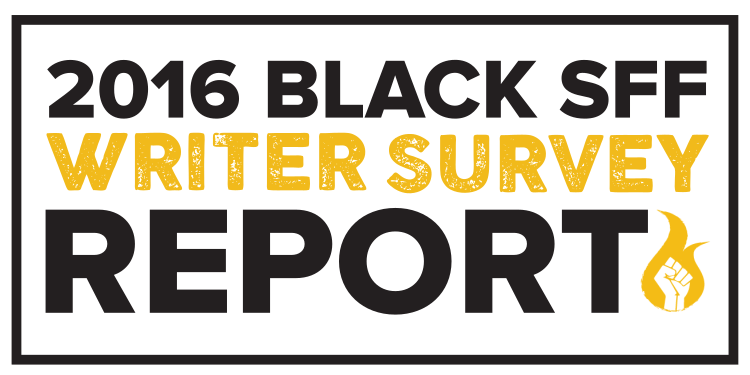 Instead, we encourage readers to view the FIYAH Black SFF Writer Survey Report as a contextualization tool. With this survey, we are attempting to add what is probably the most neglected–and most important–perspective to the conversation: that of black writers themselves. Our survey responses give us a clearer picture of who these writers are: global, writing in multiple genres, at various stages in their writing careers. In this report, we seek to collect and spotlight information and opinions of these black speculative fiction writers. We feel that this kind of insight is invaluable for a true assessment of black writers’ attitudes regarding their treatment by markets that publish short form speculative fiction and by publishing in general. Quantify the existence of black speculative fiction writers seeking publication. We received 55 unique responses. When we combine this with the number of writers that submitted work to FIYAH Magazine’s first two calls for submissions, we can safely confirm the existence of at least 107 individual black SFF writers who have submitted short fiction to magazine markets in the past year. This, of course, is not a generally reflective number of every black person on the planet who writes speculative fiction and submits it to magazines for publication. Provide submission context to existing publication data. Respondents were asked to identify the markets they had submitted short fiction to during the sample period using a list of markets generated in Fireside Fiction’s #BlackSpecFic report. Respondents also wrote in additional unlisted markets. A brief comparison: 15 of the 39 markets with zero published works from the #BlackSpecFic report never received a fiction submission from any of the respondents. Respondents clarified this in their statements, citing a lack of faith in many of the markets to give their work the same respect or consideration as they would that of non-black writers. Expose the impact of doleful publication statistics on black writers. Most respondents reported that reading reports like Fireside’s #BlackSpecFic report or the Lee and Low Diversity Baseline Survey either discouraged them from submitting work to short fiction markets or had no effect on their decision to submit work to short fiction markets. Reasons for discouragement are obvious, we think. However, many respondents indicated that the reports had no effect on their outlook because they are used to unfair treatment by these markets and the industry. Enable markets to pinpoint their failings in attracting or publishing black writers. Respondents submitted short fiction to markets with diversity statements much more frequently than they did to markets without diversity statements. Respondents also highlighted that form rejections or other generalized rejections to a submitted piece were very unhelpful to them as they could never determine whether or not there was a racial aspect to their submission’s rejection. There are more suggestions and examination of this in our section on Forward Movement. A final note: We know that some usual suspects will attempt to invalidate what we’ve captured by claiming that our analysis lacks rigor, or our methodology was faulty. This is a smokescreen that these individuals use to hide the fact that they are against making the speculative fiction publishing space inclusive and respectful to black writers–all writers, really–and their work. Using assumed (and faulty) scientific expertise to attack the experiences of marginalized people is not a new tactic, and one that is frequently used by these groups in an attempt to maintain the oppressive systems that they believe should solely benefit them. They will never admit that fact so we are making it plain here. This report is not for those people. This report is for writers, readers, editors, magazines, and fans interested in actively working against the anti-black bias inherent in this system for the sake of the writers and work that said bias excludes. The data is available for interested parties to review. The trends have already been confirmed, repeatedly. We are giving space to those most affected by this bias and these trends. We hope that you take a moment to listen to the voices collected here, and to truly reckon with what they are saying. Use the BSF Report Menu in the sidebar to navigate between report features. You can send questions to bsfreport@fiyahlitmag.com or talk to us about it on Twitter using #bsfreport. If you are interested in contributing to future surveys as either a writer or market, you are welcome to complete the form below and we will keep you abreast of new projects concerning the state of Black speculative fiction.